The Upbeat Dad! 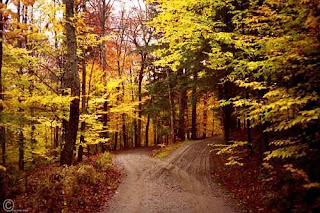 : Some Thoughts on Taking the Road Less Traveled! Starting this week, on Sundays, I'll share a short, light-hearted post, generally concluding with a poem that I've written. Sundays are light days and most of us are winding down from a fun weekend and gearing up for the week ahead. I like to give a quick jolt to the arm to encourage us as we leave our loved one to head back to our daily vocations that help us to provide for our families. Today's poem, There's Too Much at Stake , is about us taking the road less traveled. We should choose this less traveled road because there's so much at stake - our lives and the lives of our families hang in the balance. By making this choice, it leads us to live more fulfilling, rewarding lives. It may not be easy because not everyone chooses that road. Birds of a feather flock together. But a majestic bird such as the eagle flies alone. It makes a greater impact flying solo and not confirming to traveling the route that birds that travel in flocks do. Enjoy reading There's Too Much at Stake . a mountain to climb each night and each day. of war, and of strife, but what’s there to gain? but somehow that life has evaded me. to walk this road—around each scary bend. The odds are against me; but this path still I choose. I’ll march on ahead—there’s nothing to lose. to make others smile like captives just freed. to live so that blind eyes around me might see. I’ll never give up—there’s too much at stake.